The holidays are finally upon us and, if you’re like me, you’re dreaming of your mom’s dressing, your aunt’s pecan pie, and an extra slice of pumpkin pie. However, by the time Christmas comes, most of us are “turkeyed out,” looking for something with a little more flavor. And since it’s turning cold out there, it needs to be nice and warm. This time of year, the go-to meal in our family is my mother-in-law’s famous Taco Soup. She made it the very first time I went to visit them, and I’ve been making it ever since. Although it’s called a soup, it’s hardy enough to be a chili. The ingredients are simple and inexpensive, it tastes great heated up the next day, and it would keep well in a crockpot if you want to take it to a potluck. Oh, and it’s gluten free. You just can’t lose with the Joneses’ Taco Soup! * Ranch Style beans are seasoned pinto beans. If you can’t find them in your grocery store, just use two cans of regular pinto beans. Brown the hamburger meat with some of the onion and taco mix. In a large pot, add the remaining soup ingredients to the hamburger and simmer until ready (about 30 minutes). You may want to add a little water, but the consistency should be between a soup and chili. 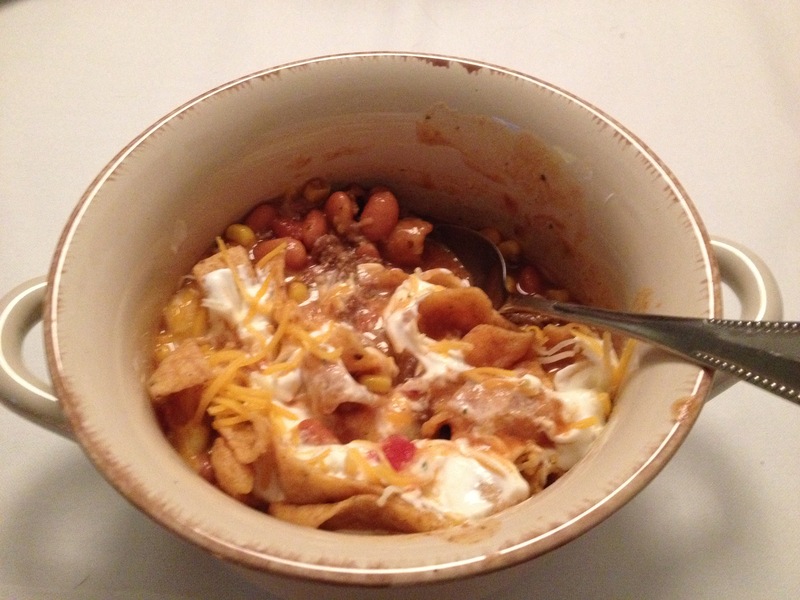 Serve in a nice crock bowl and let each person add their own cheese, sour cream, and Fritos. Depending on how spicy your ingredients are, this can be a medium to hot dish. Have something cool and sweet ready for dessert. Did you know you can freeze soup in Mason jars? Just leave about an inch at the top for the liquid to expand and use a regular lid. Wait for the soup to cool before placing in the freezer, and freeze the jar upright. Defrost the jar in the fridge or in your lunch bag if you’re at work. You can even heat the jar in the microwave, but be sure to defrost it and remove the lid first. WARNING: A rapid temperature change can cause any glass container to shatter. This is why it’s important to defrost the jar before heating it in the microwave. Similarly, you shouldn’t place hot glass (like a coffee pot) in cold water. Thank you for sharing your family recipe, Ashley. This Taco Soup sounds delicious, and it will be perfect for busy days. I can’t wait to try it! I appreciated the “helpful hint,” too. Thanks for stopping by and for the kind words. Hope you enjoy the soup! !